One of the keys to performing at a high level is maintaining a consistent source of fuel for your body both in terms of calories and electrolytes. Our nutrition selection has nearly doubled with the new space giving you a wide variety of products and brands. But remember, never try anything new on race day - experiment and find what works best for you during training. GU is the original energy gel. It provides 100 calories of high-quality carbohydrates in the form of 70-80% maltodextrin and 30-20% fructose (ratio depends upon the flavor) along with a unique blend of amino acids and electrolytes to fight muscle fatigue, speed up the conversion of carbohydrates into usable energy, maintain focus and prevent cramping. Hüma Gel: ﻿Huma gels provides the right 2:1 glucose to fructose blend using all natural ingredients that does not require a chemistry background to understand. These gels are packed with 9 essential amino acids from grounded Chia seeds that allow for easy digestion and energy for any physical activity. Chews: When you need something to chew on... Sometimes gels just don't work. Either you can't tolerate the glob or they infuse too much good stuff at once in your stomach which can lead to cramping. These products are great because they taste like gummy bears and can be eaten individually over a period of time which keeps your fuel levels consistent and your mouth occupied. Cliff Shot Bloks: At 33 calories a cube and their patented Fastpak packing, it's easy to carry and monitor your nutrient intake. The fruity-flavored Bloks feature organic brown rice syrup which is a minimally-refined source of carbohydrate with naturally occurring sodium, potassium and magnesium. No high fructose corn syrup! Jelly Belly Sports Beans: These yummy beans look - and taste - like regular jelly belly jelly beans, but they do so much more! They are scientifically formulated to maximize sports performance using carbohydrates, electrolytes, vitamins B1, B2, & B3 and Vitamin C! They are naturally sweetened and use six real fruit juices. The Sport Beans come in a resalable pack so you won't have to cry over spilled beans in your pocket. Drinks: Sometimes your body needs more than what H2O can provide. These sport drinks are low on sugar and high on electrolytes and energy. Nuun: Want to stay hydrated without adding more calories to your diet? Nuun is a sugar-free electrolyte drink that recharges your depleted salts without the calories, mess or sticky-sweet taste found in other sport drinks. What is cool about Nuun is that it is a portable effervescent tablet that you add to your own water. It fizzes as it dissolves (no mixing or shaking needed) and then becomes flat so you can easily drink it down. Lots of crisp, refreshing flavors to choose from. 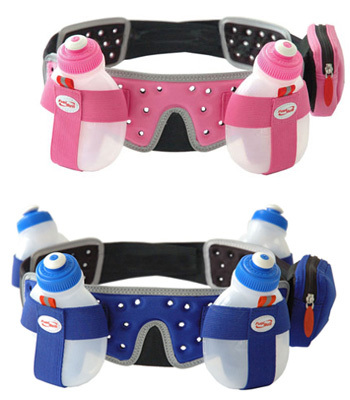 How do you carry water or Nuun with you on a workout? We have an extensive collection of hydration hardware, from hand-held bottles to full belt-style systems by Fuel Belt, Nathan and Amphipod.